Mouth. Watering. 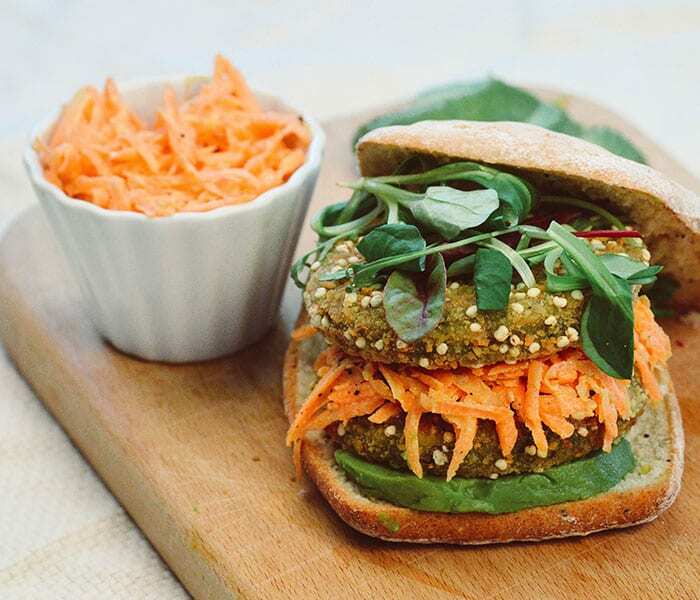 Our Kale & Quinoa patties provide the perfect base for this delicious take on a classic hamburger. With low sugar, low saturated fats, and no artificial flavours, this tangy recipe will satisfy your craving for something hearty but healthy. Add a side of sweet potato fries if you have a big appetite–you’ll be left satisfied and energised all day long! Place the Kale & Quinoa Burgers on a baking tray and cook as per instructions on the pack. In the meantime prepare the carrot slaw by grating the carrot and draining slightly to remove access water. Mix the carrot, lime juice, olive oil, ginger and coconut yoghurt, sesame seeds and a pinch of salt and pepper. Toast the burger bun and assemble as desired.